Central City Quality Edu-Care provides a safe, caring, healthy and nurturing environment where children enjoy their learning and are encouraged to explore and develop new skills. We are licenced for a low number of children which allows us to have an environment which is a friendly and inviting home away from home for your child. Children’s individual needs are met with the implementation of Te Whaariki – Early Childhood Curriculum. 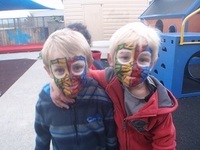 Staff and children are aware of cultural practices which are unique to the dual heritage of Aotearoa Central City Quality Edu-Care is a happy environment where children can learn and prepare for life. Our aim is to make a positive input into the lives of children who come here. We are an early childhood education centre contracted to parents and the Ministry of Education to provide a quality service. "Teachers in the centre work collaboratively to implement a programme that encourages children to explore and develop at their individual pace in a learning environment that is inviting, stimulating and provides challenge for children. Maximum use has been made of the available space to provide uninterrupted flow and supervision between a wide variety of learning areas." "An enthusiastic and well-informed director has developed, with the support of staff, a shared culture for ongoing centre development that benefits staff and parents, and contributes to the quality of children's education and care. The knowledgeable director continues to lead and model good practice that empowers staff to fully participate in centre management and operations."